The last few weeks has been quite busy for me. I finished the Tauren Marine model, and it was received really well. It got featured in the header on two different websites + it also got a place in the permanent gallery over at blenderartist.org. Very cool indeed. I also finished a first version of my 2013 demo reel and did a redesign of this website. In addition to that I was asked to write an interview by two different websites. That was really cool. I’ve never been interviewed before. oh! And one more thing. I wrote some tips for an upcoming issue of 3d Artist magazine. That magazine should be packed with blender-goodies, so if you are a blender-fan then you probably want to get your hands on that one. 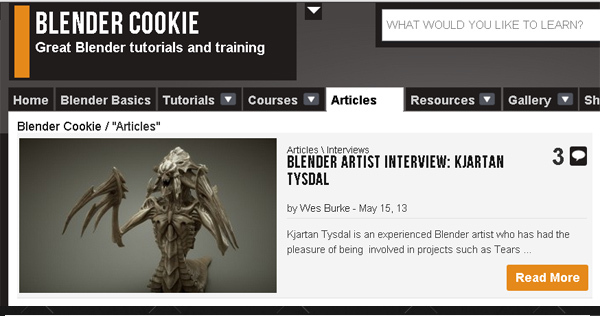 The interview on BlenderCookie (interview in English) – BlenderCookie is one of the best tutorial-sites for Blender. and Spetakkel.org (in Norwegian) – this is a Norwegian-online-magazine for creative people.